Summer and refreshing deserts pair up perfectly! There is nothing like a sundae after the end of a fun summer day. Usually the sundaes are filled with icecream, fruit sugary sauces. 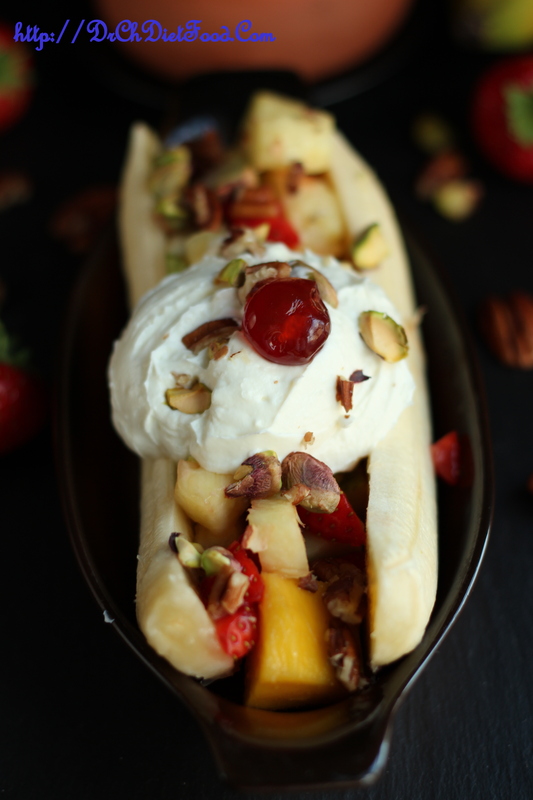 However, my recreation of the banana boat sundae still has the flavor but cuts out the unnecessary sugar, fat and calories for a deliciously healthy treat. Chocolate sauce/berry sauce can be used. Cut the banana lengthwise into two halves. Place along the outside of a boat shaped dish or any dish/plate will do. In a small bowl combine pineapple, strawberries, mango, apple, lemon juice and mix well. In other small bowl combine yogurt, vanilla essence, honey and mix well. 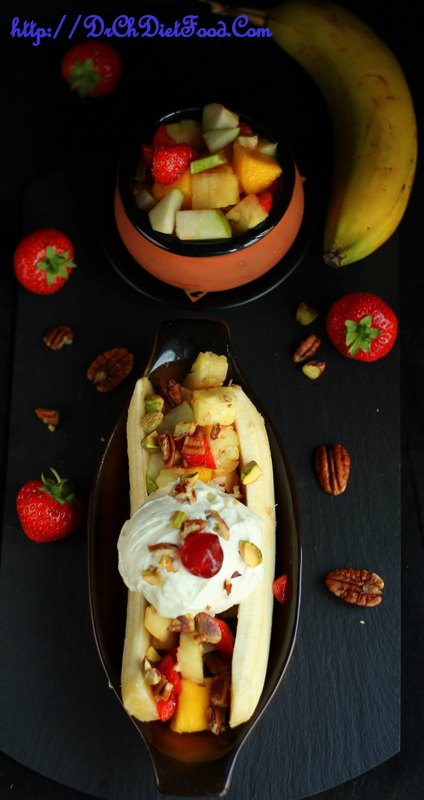 In a dish where banana is placed, put the fruit mixture in between two halves on the bottom of the banana boat. Then put 1 or 2 spoons of yogurt mixture on top of fruit layer. Finally top with chopped nuts and drizzle some chocolate or berry sauce if desired and serve immediately. 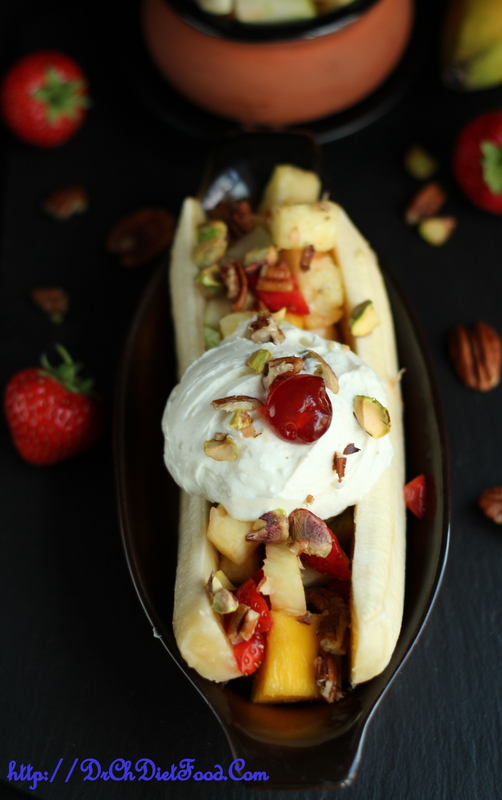 Posted on July 10, 2015, in Dessert, Indian, International, Sweets and tagged banana fruits dessert, banana split sundae, Cream free dessert, East dessert ideas, fruit dessert, healthy low sugar dessert, no bake dessert, yogurt fruit sundae. Bookmark the permalink. 33 Comments. You didn’t think I miss reblogging this Chitra? What a beautiful and tasty dessert, perfect for summer, Chitra! It seems like the flavors of the fruit would be so intense and fresh. Very creative and healthy yet delicious! Thanx a lot Shari for your encouraging comment ….that means a lot to me…have a fab weekend. .. This is an adorable treat and definitely company worthy! I love all of the fruit you combined. Perfect I was just fancying a nice sundae type snack but I like to eat healthy! So nice to hear you have liked the recipe and supported thru reblog..